Saracens confirmed today that Brendan Venter will replace Eddie Jones at the end of this season after the Australian announced he would leave his post as director of rugby following the current campaign. Jones cited family reasons for his decision to leave Vicarage Road just one season into a three-year deal, although it has been reported he is unhappy with the new management regime at the club. Venter, the former Springboks and London Irish centre, is currently defence coach with the Stormers and will take charge from July 1. The 39-year-old former international centre also made 17 Test appearances for the Springboks the last of which was at the 1999 Rugby World Cup. Jones told the club's official website, saracens.com, "After careful consideration, I have decided to leave Saracens at the end of the current season. My reasons are entirely personal. My wife and daughter have always given me unqualified support but it is now time for me to put the family needs first. I have greatly enjoyed my time with Saracens extending back to 2006 and I wish the directors, staff and players well in the future. 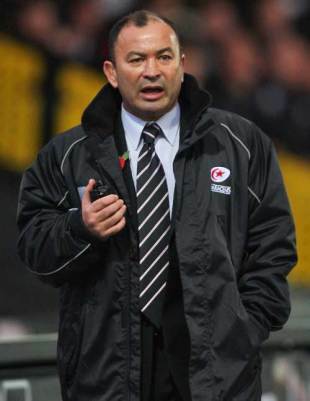 Jones, who had a short first spell at Saracens as a consultant in 2006, is in his first year as director of rugby at the club. He moved to the Guinness Premiership after helping South Africa win the World Cup in 2007 in his role as tactical analyst, defeating England in the final. He had earlier guided Australia to the final of the 2003 World Cup on home soil only to see them lose to England. "Naturally I remain 100% committed to the Saracens cause and eagerly look forward to building on the progress we have made this season and ensuring we challenge for a top 4 finish in the Premiership and maintain our strong momentum in the European Challenge Cup," added Jones. Nigel Wray, chairman, said, "Obviously we are all very disappointed to lose Eddie, but we are very grateful for all his hard work, inspiration and the terrific structural changes he has made at the club, which will hold us in great stead for the future. I know that we will all remain friends and keep in close contact. "Brendan has an outstanding knowledge of the Guinness Premiership, following his success as coach at London Irish, and he has become well known and well respected at Saracens during the course of this season, after being introduced and recommended by Eddie as a specialist coach. We warmly welcome him to the club on a full-time basis." Venter will take over next season as Saracens' seventh boss in as many years and further strengthen the club's South African connection. The club received a multi-million pound cash injection from a South African investment company earlier in the season, leading to changes on the board. Saracens have reportedly targeted Schalk Burger and Bryan Habana as potential high-profile signings while there have also been suggestions of a relocation across London to Fulham's Craven Cottage.